Russian Anti-Semitism, Or Just Affirmative Action In Action? While writing this post on Da Russophile about why Russians do not (for the most part) hate Jews – a post that will also be of interest to AKarlin readers – I came across very interesting historical data on literacy and educational accomplishment by ethnic groups in the USSR. This table shows the literacy rate among different groups from the 1926 First All-Union Census. Coming less than a decade after the Revolution this table is of course a reflection of the Tsarist education system, not of the Soviet one. Apart from puncturing one Communist myth, that the Tsarist regime didn’t do anything for people’s literacy and that it was all a Soviet achievement, it also demonstrates that Jews had the highest literacy rate of all the peoples in the Empire. 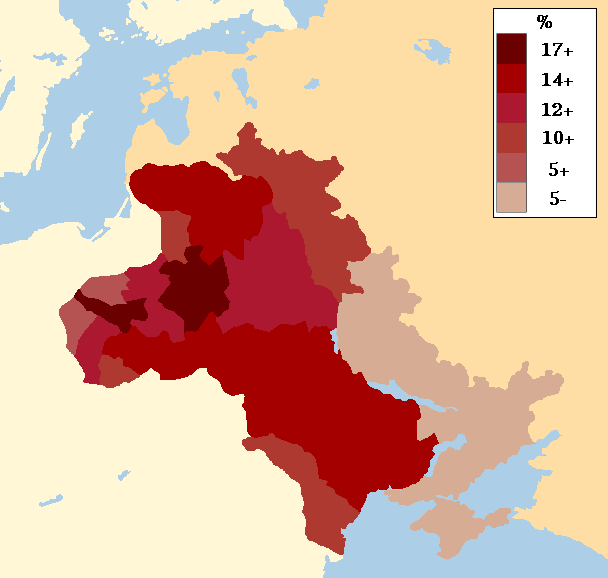 The above from the 1939 Soviet Census. Jews are way, way ahead in educational attainment. From the 1989 Soviet Census. Jews maintain a massive lead in educational attainment despite supposed rampant anti-Semitism. BTW – Notice however that Germans are bottom of the barrel, below even Chechens and Tajiks in tertiary attainment. Now that is clearly a group that is being discriminated against as German IQ is typically a couple of points above that of ethnic Russians, so their rate of tertiary attainment should be at least equal if not higher. So how to resolve these paradoxes – that Jews were “held back” from Russian schools and universities, but at the same time somehow maintained educational qualifications well in excess of the Soviet and Russian averages? I think the answer is quite simple; both are true. Ashkenazi Jews (such as lived in the USSR) are typically recorded to have a mean IQ about one S.D. above the white European norm. So all things equal they will perform much better than ethnic Russians. What the imperial Russian government did in fact do was a form of pro-indigenous majority affirmative action. In 1887, the quotas placed on the number of Jews allowed into secondary and higher education were tightened down to 10% within the Pale, 5% outside the Pale, except Moscow and Saint Petersburg, held at 3%. It was possible to evade this restrictions upon secondary education by combining private tuition with examination as an “outside student”. Accordingly, within the Pale such outside pupils were almost entirely young Jews. This 10% quota broadly correlated with the actual percentage of Jews in the Pale of Settlement. It all makes complete sense. (1) The 1920’s were a philo-Semitic period and AFAIK quotas on Jews entering universities weren’t present during this period. I do not know if there were formal quotas against Jews in the later, “anti-Zionist” period of Soviet history but it IS anecdotally known that barriers to entry into many institutions were higher than for other Soviet citizens. Certainly this played a major role in setting Soviet Jews against the regime. This is the well-known version which stresses Russian anti-Semitism. (2) The other explanation is that by 1989 when more than half of Jews had higher education the percentage of Jews who could access it even based on pure meritocracy had been maxed out. Let’s crudely assume a mean IQ of 100 for Russians and 115 for Jews with an S.D. of 15. This means that 16% of Russians and 50% of Jews will have an IQ of 115 or above. Let’s say that this is the part of the population that had access to a higher education in the Soviet era (this makes sense: The system was, for the most part, meritocratic, and standards for entry where far higher than today when higher education is far more accessible). According to our stats, the actual higher education achievement figures in 1989 were 14% for Russians and 56% for Jews, i.e. Jewish access to education was actually higher than what you would get by assuming reasonable mean IQ’s and no anti-Semitic discrimination. Of course even slight differences in the actual mean IQ levels (e.g. a Russian mean IQ of 97, not 100 – as may be more realistic) will have substantial impacts but they would not cardinally change the overall picture. My preliminary conclusion is that anti-Semitic discrimination at least in terms of higher education was negligible at least as indicated by this simple thought experiment. A more detailed model would be preferable but I do not see how it could invalidate any of this. Russia has long been presented as a seething bastion of anti-Semitism. To the contrary, an objective look at it through measurable impacts finds that at worst what existed was a system of pro-indigenous affirmative action. It is loosely comparable to official AA in American college admissions, however in the US case it is geared to aid NAM’s. Nonetheless as Blacks are about one S.D. below whites even fairly drastic interventions do not much impact on white admissions. The effect on Jews, who are in turn one S.D. above whites – or two S.D.’s above Blacks – is of course all but negligible. So although pro-NAM’s-AA in the US does disadvantage Jews it does so to a far lesser extent than did pro-non-Jew AA in the USSR. A better comparison might be with Asian-Americans, who are (slightly) discriminated against in favor of whites in the US. For the USSR, replace Asian-Americans with Jews. Of course Asian-Americans will rarely improve their lot by going back to China or Korea, unlike Soviet Jews emigrating to Israel or Silicon Valley; hence, they are quiescent, and largely satisfied with the American regime.